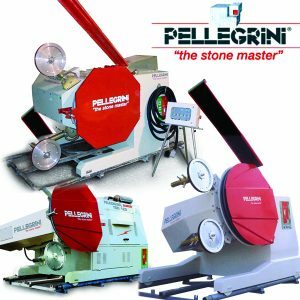 Miles Supply is the exclusive distributor for Pellegrini in North America. See their website for more information. Telediam 25: For block squaring, bench-cutting and in the INVERTER version, for cutting granite or beton. TELEDIAM 45/55/65 SUPER: In the versions, with or without INVERTER, to cut granite or marble. For medium size cuts in massive rock. TELEDIAM 80-100 SUPER: Can be supplied with an Inverter for granite, or without for marble. For large cuts in massive rock. TELEDIESEL 100-120 Super: Fitted with a Diesel engine, has a hydraulic torque converter for diamond wire speed adjustment. The machine is completely stand-alone and can make cuts of large size. Various types of pulley and supports for cutting in all positions. Ask us about the radio remote; controls Pellegrini Telediam Quarry Diamond Wire Saws (45-100HP) up to 100 meters away.